On October 15th and 16th, 12 year old Tazio Torregiani entered in the final round of the 2011 WKA Divisional New Jersey Sprint Series. This was to be Tazio's last race weekend in a Comer 80 powered cadet, as next year he will move up to the Junior class. The race took place at Raceway Park, in Englishtown NJ, only this time in backwards configuration. Tazio also raced in Yamaha Sportsman class, clutch problems kept him from finishing better than third. But it was to be in cadet class that Tazio was unstoppable. In the first cadet final race on Saturday, Tazio passed for the lead with three turns to go on the last lap, and managed to lap a driver with two rivals on his tail. One of the other drivers got alongside of him, but Tazio stayed on the gas and dove in the last turn on the inside keeping the lead all the way to the checkered flag. "I passed for first.. I got it.. and going into the last turn I held my line and got the turn..and than I got the win" said a very happy Tazio right after the race. You can see a video of this race at the following link: http://youtu.be/QSa8qBcbFQU?hd=1. In the second cadet final on Sunday, Tazio passed for the lead with two laps to go and defended hard all the way to a wheel to wheel drag race to grab back to back wins in cadet. The Fairfield county racer has been driving in the comer/cadet class since he was 8, and this was the best way to end it. The TazioRacing.com team would like to thank Doug Fleming for his help and support with Tazio's comer motors. Torregiani in November will join Mike Doty Racing in his biggest race yet, the Supernationals at Las Vegas. This is one of the biggest kart races in the world, and it will be Tazio's last race in cadet class, with a mini rock motor. Tazio Torregiani would like to thank his sponsors NewCountryPorsche.com, GoPro, Leatt and Fuel Clothing. To follow Tazio and his team like his fan page at: http://www.facebook.com/pages/TazioRacingcom/248819618492981. 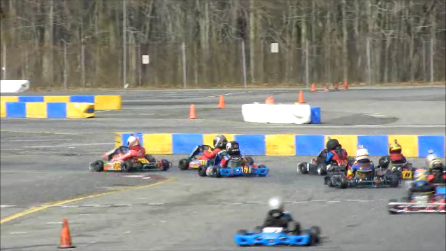 ﻿ The 2011 WKA NJ Sprint series kicked off at Raceway Park in Englishtown NJ on May 14th and 15th. A very confident Tazio Torregiani arrived after his third top ten Man Cup National finish in Southbend IN, and a win on Mother's Day in the Raceway Park Karting Series. Tazio was very fast out of the box. In cadet class, on Saturday"s Final 1 race, Tazio caught the leader on the last lap at the end of the back straight. It did not look as if he was close enough, but Tazio braked very late and dove in for the pass, he put his kart right alongside but the other driver didn't let him in and closed the door. The two karts made contact and spun off the track allowing a close third place driver to grab the win. In the Cadet Final 2 race on Sunday, Tazio was even faster on a drying track. He passed for the lead early on and opened a nice gap to the second and third karts who were battling for position. On the last lap as Torregiani entered the straight, he took a more defensive middle line and hit a puddle of water half way down the straight which caused him to slide off the track as he braked for the turn, giving away another win to the driver behind. It would be in Yamaha Sportsman Light class that everything would go Tazio's way. It seemed as every race was his to win or loose. During the final Race he charged from third and passed for second, and than passed for the lead with his Merlin kart. He opened up a sizable gap which allowed him to finish first and grab his first Regional win of the year. The second round of the WKA NJ Sprint Series is at NJ Motorsports Park in Melville NJ on the first weekend of June. 12 year old Tazio Torregiani would like to thank Mike Doty, Mike Ramirez, John Baio and Chris Perez for all their help during the weekend. Tazio would also like to thank his new Sponsors Fuel Clothing and SteelMX / SMX Optics. To sponsor Tazio or for more info you can go to http://www.hookit.com/members/taziotorregiani. The weekend of March 12th, marked the second round of the 2011 WKA Man Cup National Championship at Carolina Motorsports Park, in Kershaw SC. CT race driver Tazio Torregiani arrived at the new track with his team confident, after a top ten finish in December at Daytona. The very fast .7 mile circuit was not easy to figure out. To make it even more challenging, WKA introduced a new Bridgestone tire for this round, to replace the very different and more familiar MG tires. Torregiani was one of the few drivers not to have driven this track or the new tires before. It was a struggle for the TazioTorregiani.com Racing Team to find the right set up. Quick learning and good feedback, together with a great drive still helped Tazio finish 12th in the first cadet final from a 19th qualifying position. In the 2nd Cadet Final on Sunday Tazio was faster. After moving up through the field, on the last lap he made a wonderful pass for 11th place, just to be taken out by the same driver in the following turn. He was hit on the right rear tire and spun off the track into retirement with two corners to go. The 12 year old driver was not very happy. He did manage to save his best result for the last race of the weekend in Yamaha Sportsman light class. A driver flipped her kart on front him in the pre final, but no one was injured. In the final Tazio drove his best, making several passes and finishing 8th from 14th to another top ten finish. The TazioTorregiani.com Racing Team next stop is at the MRP circuit in Southbend IN, last weekend of April, for the third round of the WKA Man Cup Sprint series. Fairfield County driver Tazio Torregiani and his team would like to thank Engine Wizard Doug Fleming, and Coach/Tuner Mike Doty for their great help and support at the track. The TazioTorregiani.com Racing Team is brought to you by www.NewCountryPorsche.com. Do not confuse go-karts with those Little Rascals-esque plywood toys on wheels. Tazio Torregiani, an unassuming 12 year-old with race cars in his blood, is way beyond such child's play. Tazio's professionally manufactured if diminutive racecars, known in racing circles as "karts," are the real thing. Which means they go very fast, something eminently appealing to him. "What I like most about racing," says Tazio, "Is the thrill you get going 60 miles per hour." His father Patrizio himself has a thirst for speed. Once a racecar driver, he is now a sales specialist and Internet manager at New Country Porsche in Greenwich. Patrizio was captivated at an early age by his father's Porsche 911 in Rome, Italy, where he grew up. 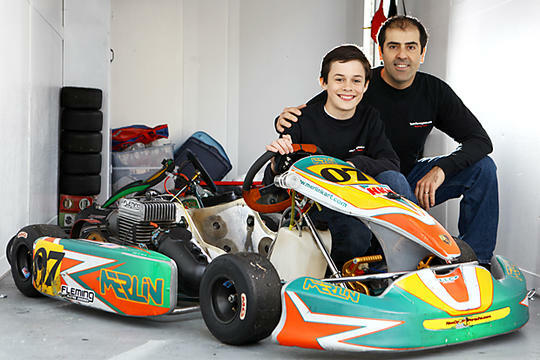 The Torregiani family lives a traditional life in Stamford -- but for the driveway's permanently residing trailer that houses Tazio's two racing karts. Tazio, who has a 10 year-old brother, Dario, plays soccer and does his homework just like any other pre-teen boy. The difference, however, is in his far-from-regular weekends. Tazio trains and races year-round both regionally and nationally on tracks as near as Englishtown, NJ and Mount Kisco, NY, and as far away as Daytona Beach, Fla. But he manages to keep focused on the track while staying ahead of his schoolwork. "Karting is hard physically and mentally," he says. Tazio began racing at the age of six. His family was vacationing in Portugal (where Tazio's mother grew up) and the family visited an outdoor kart track. Tazio's talent was soon realized. "He just stepped on the gas and took off," Patrizio recalls. "He was a natural. As we were watching him lap the track the owner asked me how long Tazio had been driving. I told him it was his first time, and he told me I should get him a kart." When they returned home, Patrizio did just that, and Tazio began racing -- and winning -- soon after. He's been successfully doing so ever since, flying along in races with up to 34 other karts, on tracks at upwards of 60 miles per hour. And if that doesn't exactly evoke Formula 1, G-force-pulling speed, remember the open vehicle is just one inch off the ground and only five feet long. But that doesn't seem to bother Tazio. "The most challenging aspect of racing is when you are on the track, thinking of what your next move is and how you are going to execute it," he says. Tazio intends to race at Grand Prix New York this winter at select races on Sundays. Patrizio says Tazio "doesn't just race casually, he takes it very seriously. He's very fast and very determined." And Tazio is resolute about steering his driving into professional echelons. "I want to be a Formula 1 driver," he states matter of factly. "It was my wife's idea to name him after the great Tazio Nuvolari," says Patrizio, referring to Italy's "Flying Mantuan," among the greatest Grand Prix drivers of all time. Tazio has certainly gotten a head start in his race toward racing greatness. But for now, he looks forward to getting his learner's permit in a few years, just like any other 12 year-old kid. 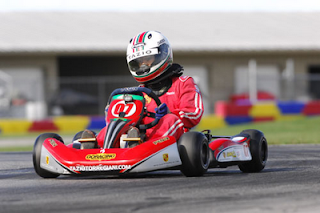 12 Year old Tazio Torregiani will race at Grand Prix New York this winter at select races on Sundays. 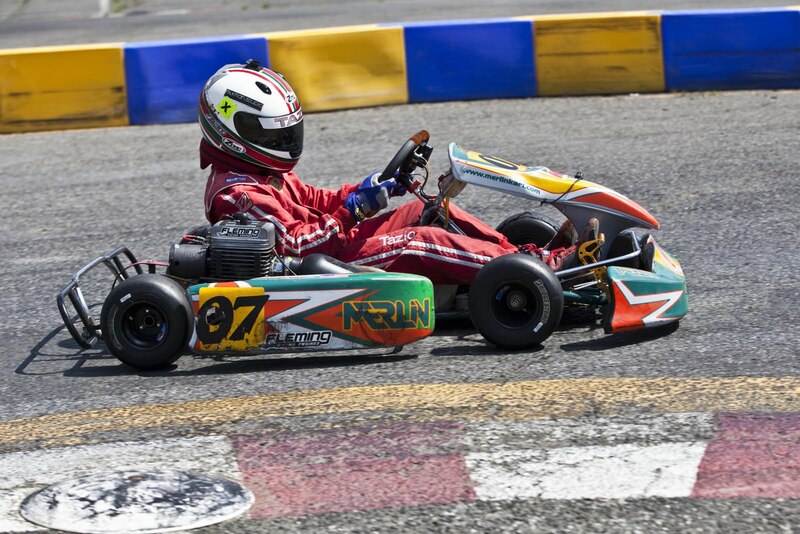 Tazio is an outdoor sprint kart National racer, but racing at the local indoor track in Mount Kisco NY gives the CT karter a convenient opportunity to stay active and sharp as he prepares for his next big WKA race in South Carolina in March. the karts here are different. They are bigger and heavier and are powered by a four stroke engine versus the lighter two stroke power Merlin karts he drives outdoor. The racing here however is no walk in the park for Tazio. Passing is very difficult in the very tight indoor tracks, and he races against the strongest group where the fastest are 15 to 16 year old. To make the racing fair Tazio has to add 50 lbs ballast weight to his kart to match the weight of the heaviest drivers in his group. The first race of the Junior winter series was Sunday January 9th. In the closing lap of qualifying Tazio secured Pole Position, and in the third and final race Tazio made his move with a last lap pass and won the race. In the second round on 1/23/11, Tazio went for a difficult pass that didn't work which kept him from winning. He did however secure fastest lap of the race which awards bonus points. Tazio is currently leading the indoor points standings and will be back at GPNY on 2/6/11. 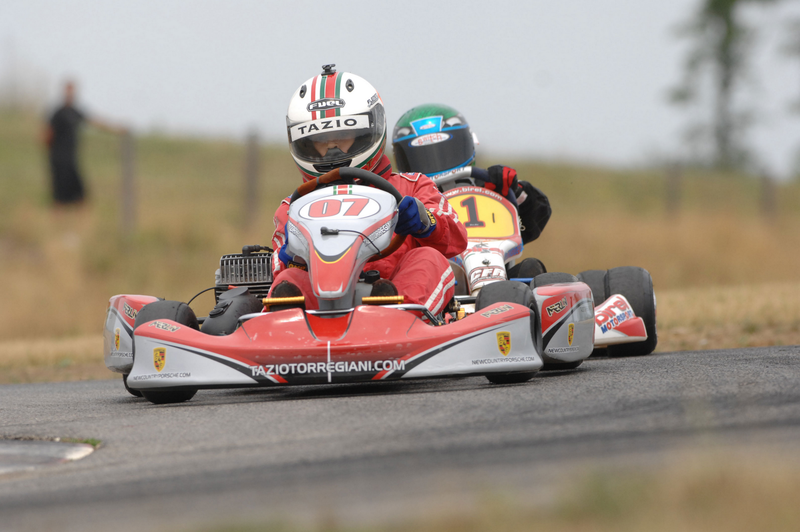 Top ten National finish for 12 year old CT race driver Tazio Torregiani. The TazioTorregiani.com Racing Team returned to the annual Daytona Kartweek in December just after Christmas. The 2011 WKA Manufacturer's Cup National Sprint Series starts here, at the famed Daytona International Speedway. This time the challenge was going to be the strongest for the team with record entries from all over North America. 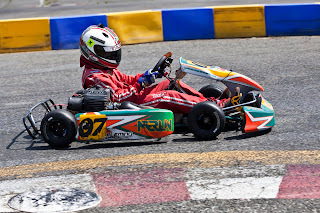 Sportsman driver Tazio Torregiani arrived on a high, after being one of the fastest national drivers at the closing WKA round in Melville, NJ, and qualifying on the front row. Tazio entered the Daytona Race with two Merlin/Fleming karts for three different classes: Cadet, Yamaha Sportsman light and heavy. This was the first time for Tazio to race in National Yamaha class. In open practice Tazio was fast right away, setting some really quick laps especially in Yamaha class. But it was in Cadet that things were going to look better. 50 National drivers attempted to qualify for only the 34 spots that would take part in the final races. Tazio qualified 15th overall and made the race as expected. In the pre-final race he fell to 17th at the start, but quickly fought his way back and finished 14th. This would be his starting position on the grid for the Final. In the main race Tazio got a clean start and engaged in one of his best battles including a last lap pass that gave him his tenth place finish. You can see the on board video of this race by clicking here. On race day 2 Tazio went better in Cadet qualifying to a 12th position, and moved up to 9th in the prefinal race. In the Final 2 race Tazio was very fast out of the box and was able to climb as high as 6th. Unfortunately by that time there was so much rubber on the track, that a tire pressure miscalculation gave Tazio's kart too much grip mid race, which developed a bad under steer. He was still able to finish 11th out of 34. In the Yamaha Sportsman class Tazio was very impressive as a rookie, qualifying his Merlin/Fleming kart in 8th position out of 52 National entries. To Tazio's disbelief, he was disqualified after not making the minimum 260lbs weight by three pounds. On the second day, traffic in qualifying and a kart loosing a wheel on front him in the race, kept Tazio from finishing better than 22nd out of 34. Overall Tazio made it clear that he was part of the top ten fast group in National Man Cup. 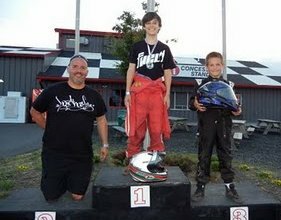 Fairfield County race driver Tazio Torregiani plans to stay active, by entering select races at GPNY indoor karting in MountKisko NY, in the junior winter league. In preparation to the next National race in March. http://www.newcountryporsche.com/, http://www.vincentgarage.com/ , and http://www.mikedotyracing.com/ . 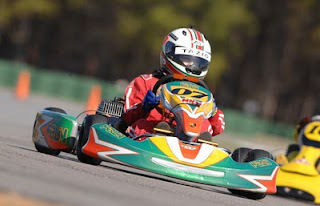 National Cadet Kart Race with front and rear view Camera, WKA Daytona Kartweek 2010. Great Racing video,this one is updated and includes front and rear viem camera shots. 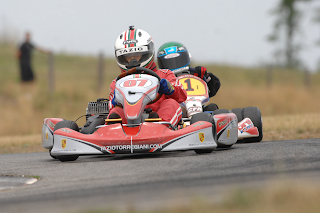 You're on board with Tazio Torregiani as he battles his way through the field to a top ten National Finish at the legendary Daytona Kartweek. 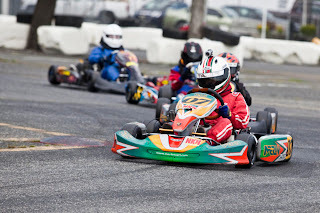 This is the WKA Manufacturer Cup Sprint series in Cadet class on December 29th 2010. The fast racer #80 is the son of Indy 500 winner Buddy Lazier. Great action.